Most of us who have been wearing jeans for long enough already know what styles and brands best flatter our figures, but for many of us, finding the perfect pair of jeans is still quite the task! 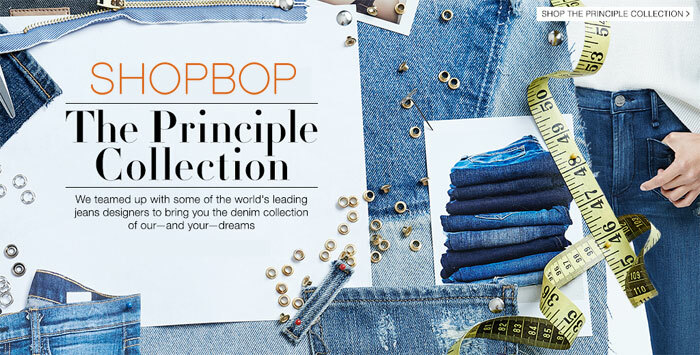 Fear not…because if you’re ready to dive into the premium denim market, Shopbop has got you covered with their new Principle Collection. This is so exciting…the retailer has partnered with 15 of the biggest names in the denim industry to design an ultimate collection of a wide variety of fits, styles and washes. We’re talking pieces from Rag & Bone/JEAN, AG, McGuire, Paige, FRAME, R13 and many, many more, in the form of flares, skinnies, crops, baby boots, micro flares and a few relaxed styles as well. They even squeezed in a classic BLANKNYC Vegan Leather piece (how couldn’t they?). 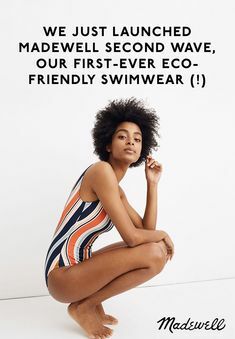 I’m totally digging this collection, and Shopbop put together a great little lookbook in the form of a guide for those who just aren’t quite sure where to start. There are even two petite styles involved to be sure to include everyone! 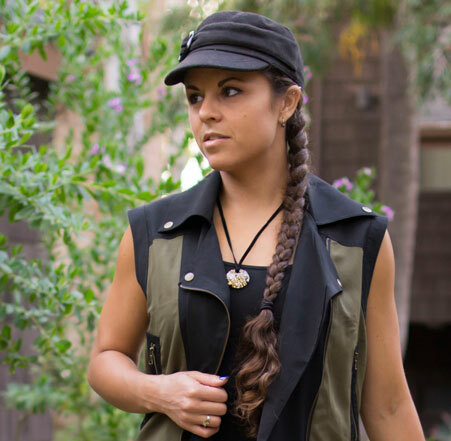 If you’re looking for a serious staple piece, this is a great place to look! The media sure has been trying to push this “denim is dying” idea on us for several months now, but the reality is quite different…and Shopbop is here to prove it. Check out the Principle Collection below! Hey all! You might have heard a little bit about this fairly new name called SOORTY, as we’ve been posting about their activity at events and some of their revolutionary denim technologies for several months now. It’s always exciting checking out a new denim brand and presenting it to Denimology readers! Although, SOORTY isn’t exactly your everyday denim brand… I feel lucky to have had the opportunity to receive a pair and experience just how great they are. There are many stretchy, figure hugging, move-with-you denim brands out there that rival activewear and shapewear, but SOORTY is in a league of their own. So without further ado, read on for my SOORTY Zumba Jeans review! I know I don’t usually post on Thursdays anymore, but I thought this piece was just a bit too hard to resist. Probably good enough to span through Friday and the weekend! So, I figured I’d make an exception. It’s been about 4 years since I was married, and I remember spending countless hours sifting through online bridal shops until my mom finally dragged me to an actual boutique so we could do a fitting in person, which honestly is often a better idea. 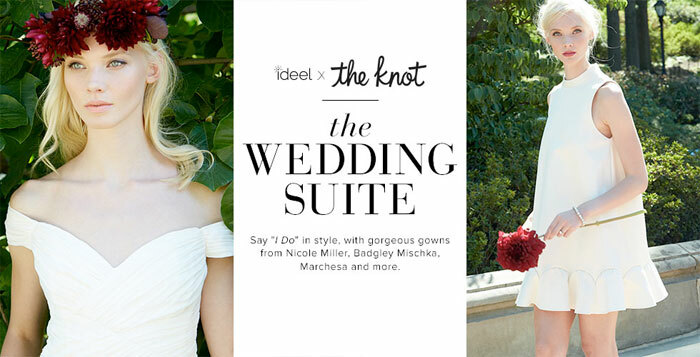 However, you can’t deny there are always awesome deals online, and so I was excited this morning to see a great collab between one of my favorite event-based sale sites, Ideel, and the website I used to help plan my wedding, The Knot! These two joined forces to offer all brides-to-be an impressive collection of marked down gowns from all sorts of top names, from Nicole Miller to Sue Wong to Badgley Mischka to Tadashi Shoji and more. So I know this is one of those situations where you’re going to do less reading and more shopping…so I’ll keep this short! Check below for the dresses that really popped out for me, and made me wish this sale was around years ago when I was obsessively searching for the perfect one! Enjoy…and good luck narrowing down your options!! This sale ends in four days, so hurry, I’m sure it will sell out fast and many styles already are! I think I’m kind of glad I love jeans the way some gals love bags and shoes…jeans can be expensive, but they are SO much easier to bargain shop at least than some of these insanely gorgeous, durable bags out there! Just like with jeans, bags fit with the “you get what you pay for” monicker but they take planning if you really want to get your hands on a quality “investment piece” that will last you just about forever. I’m always for buying less and paying more for quality, because if you’re out buying a multitude of cheap items so you have a new one every time one falls apart, eventually you end up spending about the same if not more. I like finding a piece that I will love for a long time and not feel the need to hunt for another so often. Aint’ nobody got time for that! 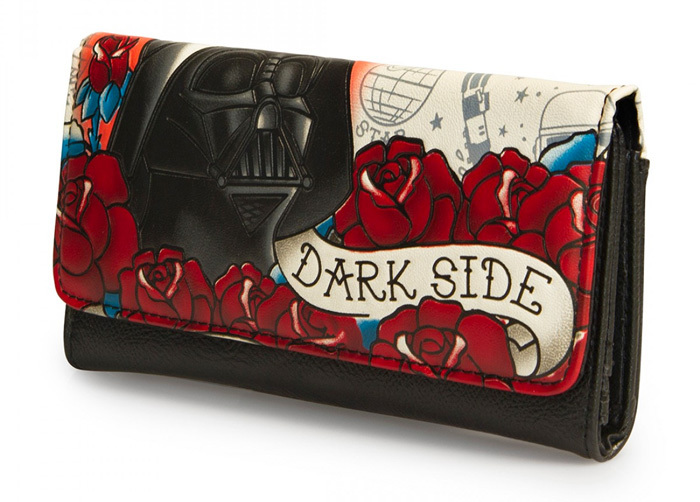 Either way, there ARE a ton of high quality bags out there that won’t completely break your bank. Couture is pretty and all, but not always my thing. I always look for leather, because it lasts longer, and solid colors because I tire of patterns really fast and they don’t always fit with everything (and I like playing with patterns more with clothing, if at all). I like classic pieces, so I’m always willing to hunt awhile for one. Right now I usually carry Foley & Corinna, Coach and Rebecca Minkoff because I adore their simplicity, functionality (they carry all the things! ), ability to be lightweight (I love little details but don’t need to show off) and yet carry what I need, and longevity. I’m sure I’ve been carrying the same cobalt blue Foley & Corinna Mid City Tote for at least two years now (see it here), and it still looks and works great. I use it for workdays, so I always have what I need, but on the weekends I carry lightweight, smaller crossbody bags around so I don’t kill my back and have free hands, like Minkoff’s Mini Mac and my Foley & Corinna Disco City Tote. 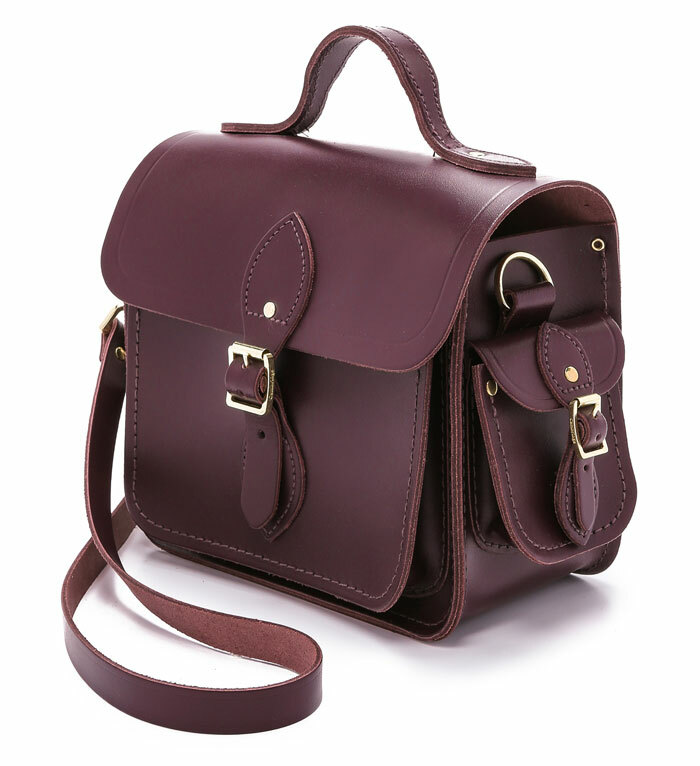 I’ve been eyeing another cute brand with an abundance of simple leather crossbody bags for years, The Cambridge Satchel Company. Just the name alone brings me back memories of visiting Cambridge almost ten years ago (holy crap that long?). Hand made in London, these little bags look like they pack a punch and then some, and seem to be popular in an underground sense, although a few celebrities favor them, such as Taylor Swift. They’ve also won numerous awards in the UK, such as the Queen’s Award for International Trade in 2013. They are not very expensive, with most under $300 which is awesome for a bag that’s going to last you a long time, and are extremely versatile. They first caught my eye when I saw how many colors they had available in each style! There’s obviously no question that rock n’ roll, art and fashion go together like cheese and crackers, and that pretty much describes my life (minus the cheese). so I am ALWAYS excited to discover fashion brands that understand the marrying of all three and pull it off with effortless style. Many go for it, but some just seem like complete naturals and live it to a T. Nok Nok is a denim/contemporary fashion brand out of London, inspired by “vibrant subcultures mixed with the freedom, hippie vibe and nightlife from Ibiza, the Spanish island in the middle of the Mediterranean sea.” Ibiza? You have my attention. Being an electronic music DJ, that word is music to my ears, as the party capital of the world that us dance music buffs dream of visiting one day. 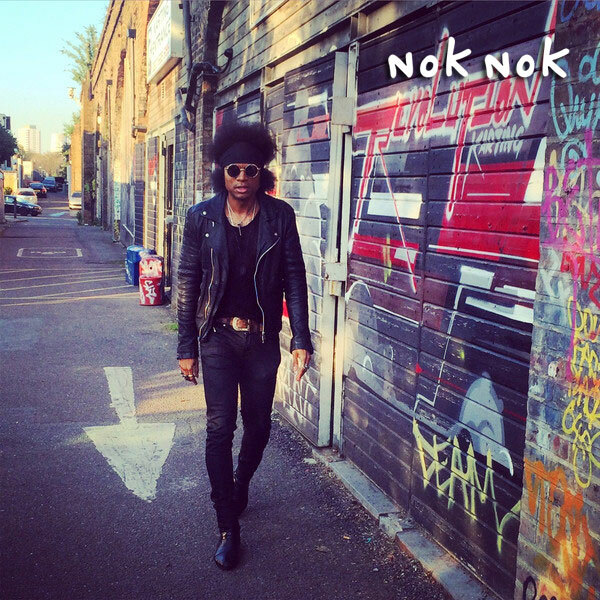 Angel NokoNoko is the designer and face behind the brand Nok Nok, and he and his sister Montse are both from Ibiza. The endless energy of the Spanish city’s nightlife inspired the brand, after Angel graduated from Central Saint Martins and gained experience from various high-profile fashion jobs in Paris and even ran a high-end menswear brand. Montse used to model and dance, and moved to London after she studied fashion business in Barcelona. Even as a teen, Angel had a fashion bug, customizing jeans and other fabrics for himself and friends and parading around in his creations at nightclubs once night fell, and gaining a name for himself as someone who knew a thing or two about creating unique pieces. Oh, and get this…Angel is now also a DJ, rocking spots such as Ibiza itself, Tokyo and London, of course. He also runs the The Nok Nok Radio Show at London’s underground Dejavufm. Premium brands are always fun, and it’s fascinating to see what they all come up with season after season. Unfortunately, most of us find some of the neatest stuff we find might often be just a bit out of our financial reach!! I’m always impressed with brands that are able to keep price points relatively low, while keeping quality in durability, manufacturing quality and in the overall design just as high as the others. American Eagle Outfitters has always been one of those, with their jeans pushing the premium line more and more, year after year, as well as other items they carry. Another one that has caught some serious blogger love lately is BLANKNYC, with a huge variety of edgy looks such as frayed shorts and their popular vegan leather line, both of which have launched the brand into the hands of festival goers this summer season. Beyond just shorts and moto jackets though, BLANKNYC proves that a jean isn’t just a jean anymore, with super creative designs coming out at a fairly consistent pace, all under $100…and I can’t get enough of their humorous pop-culture inspired wash and color names! The brand describes themselves perfectly, as being “ramped up with urban attitude” and “stripped down with irreverent edge.” Born in Manhattan in 2007 with the release of their studded Skinny Classique jean, they have been “creating approachable clothing in obsession-worthy fits, fabrics and design.” I have a few pairs of jeans from BLANKNYC and they are definitely some of my favorites! 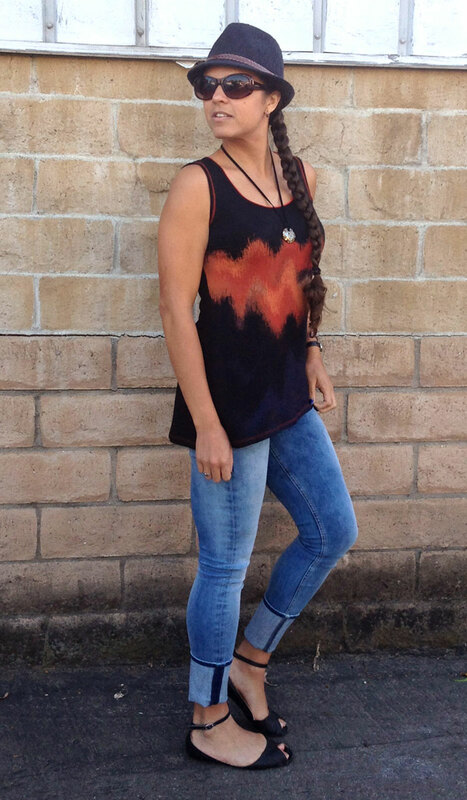 I love their fun prints, hardware details, fabric feels and even the fit is pretty impressive. Their new arrivals have me drooling…I’d wear just about any of it, especially some of those wrap jackets, black shirts and fitted jackets, drop-hem skinny jeans (a very awesome trend right now) and laid back, plaid shirts. I collected my favorite pieces below from their new collections, so enjoy! Images: Revolve. ATM Anthony Thomas Melillo Jumpsuit, Lovers + Friends Megan Top (click image to shop each entire look). Oh ’90s, how I miss thee sometimes…I believe these were the best years for music, and the fashion sense was coming off of the uber colorful and whimsical decade of the 80s, with a slightly toned down and more simplified touch. I often wish we could go back to the ’80s and ’90s both for the music and fashion tastes because in retrospect I find it to be one of the most fun, free and creative times. Nowadays, in both worlds, everything seems based off a template, or formula, and with the market being so much more competitive than it used to be, it’s tough to come out with a 100% new idea. Of course now, we see an emergence of such ’80s styles such as crop tops and acid wash jeans, and it sure is fun to see how cyclical things can be when it comes to style. 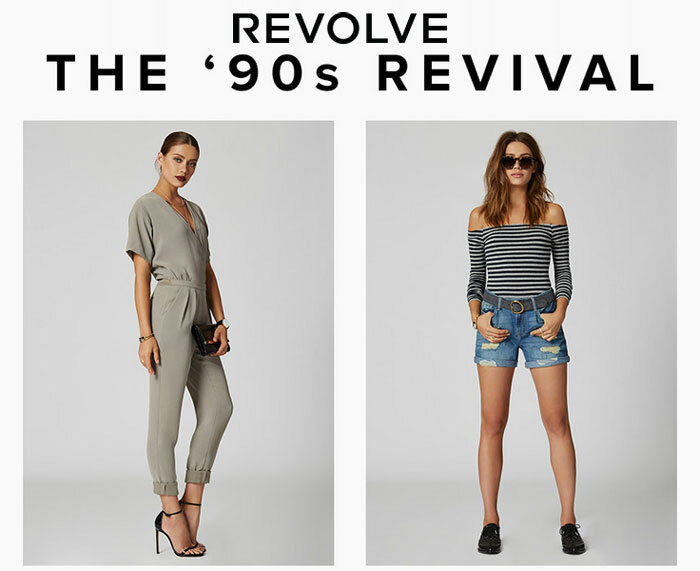 One of my favorite retailers, Revolve, has come out with a new collection of ’90s inspired looks which is both current and nostalgic, and to me has such a great balance of class, elegance and whimsy. Many of the styles are original in their own right, whether or not they are based off a timeless or one-hit-wonder look. Generally I don’t go for any particular look, and pick pieces for myself that I just happen to like or that fit well with pieces I already own, but I really had a lot of fun looking through some of these outfits and coming up with some new ideas for my own wardrobe. Revolve included many more looks than I am showing here, so I picked out my favorites…and then broken it down even further at the very bottom of this post with my favorite pieces from each look. Each look has a statement piece that is featured but click on any image to see them all and shop everything that Revolve put together for each one. One of the things that I like the most about having a blog is checking out these themed lookbooks that both Revolve and Shopbop put together and sharing what inspires me, so I hope everyone enjoys them as much as I did!